Twenty-eight more Palestinians have been killed since Israeli military forces launched a ground invasion into Gaza, according to Ma’an News Agency. 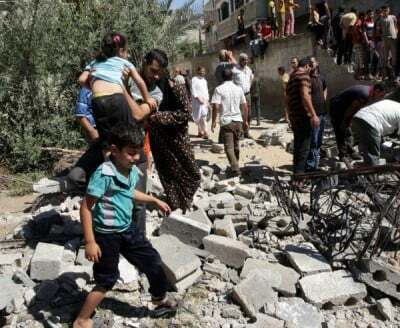 “Targeted shelling” apparently killed three children in a home in northern Gaza. The three children killed in their bedroom were: 14-year-old Ahmad Ismail Musallam, his 13-year-old sister, Alaa, and his 15-year-old brother, Muhammad. A toxic gas is being fired at Palestinians. “Dozens of Palestinians, including children, arrived at hospitals suffering from suffocation after inhaling a white poisonous gas fired by the Israeli army in the northern Gaza Strip and in the Shawkah neighborhood near Rafah, to the south,” Dr. Ashraf Al-Qidra, a spokesperson for the Health Ministry in Gaza, stated. Doctors are not sure what the gas happens to be but cautioned Palestinians to not panic and cover themselves with “tarpaulin coats or nylon clothes” if they start to inhale the gas. Israeli Defense Forces data provided to Haaretz claimed 17 “Palestinian militants” had been killed and “some 150 targets hit” since the ground invasion started on Thursday night. Altogether, the death toll for Palestinians is now 267, according to Haaretz. At least 47 children have been killed, including the four children who were bombed on a Gaza City beach right in front of a hotel where international journalists are staying. More than 80 percent of deaths in Gaza since Israel’s assault began more than ten days ago have been civilians. Physicians for Human Rights urgently warned Israel’s defense minister, Moshe Ya’alon, not to bomb a hospital after “warning missiles” had struck the hospital on Friday. It was the only hospital that specialized in treating disabled and comatose patients in Gaza. The IDF did not apparently care and issued a notice to evacuate. The nursing building was bombed. Seventeen patients who could not be evacuated remained in the building, along with foreign activists who refuse to leave the hospital as long as patients remain there. The United Nations Office for the Coordination of Humanitarian Affairs reported on the emergency situation in Gaza. Over 1,764 have been injured by Israel’s assault so far. More than five hundred are children. The assault has displaced 22,900 people and fifty percent of “sewage pumping and treatment centers” no longer are operating. Palestinian militant groups have continued to fire rockets into Israel. Primarily, those rockets have only killed one person and maybe injured 26 people. Most have been landing in open areas or have been intercepted by the US-funded Iron Dome system. It is estimated that 96,400 Palestinians are now in need of “shelter assistance” because of destruction or damage to their homes. On July 14, Norwegian doctor Mads Gilbert, who is in Gaza, told “Democracy Now!” about the staff at the Al Shifa Hospital, where many children attacked by Israel are being brought. If one can imagine, the crisis has deteriorated even further. Dr. Nafiz and his team of nine doctors are working in 24-hour shifts as they try to deal with the influx of patients but they are struggling to cope due to severely limited resources and the dangerous journey to the hospital. One of the burns team has already been prevented from working because the airstrikes make it too unsafe for him to travel from his home in the south. Only one bed is empty in the burns unit and the shortages in medical items have become even more severe in recent days. The unit has only received about 30% of the basic items they have asked for. “We never had this shortage in the most basic items before,” Dr. Nafiz says, “In the past, what we ask for we get.” At this point the burns unit will run out of the most essential medical supplies in just one week. Yet, again, it has only gotten worse since the ground invasion began yesterday. This could all easily be stopped. The United States government could pressure Israel to withdraw forces and stop its assault on Gaza. However, it won’t. It has given full support to Israel, even going along with the propaganda that any carnage that happens now is primarily Hamas’ fault because the group rejected a ceasefire proposal.